Patriots Training Camp is a fun and FREE thing to do this summer in Foxboro, MA. On select dates this summer, you can watch the New England Patriots train and practice for free at Gillette Stadium. There will also free fan activities, games, photo opportunities, and more. Training camp gates will open at 8AM and close one hour after the conclusion of practice. Both the practice and parking is free. More dates may be added this summer and dates and times can change at anytime so it’s best to head here for the most up-to-date information. 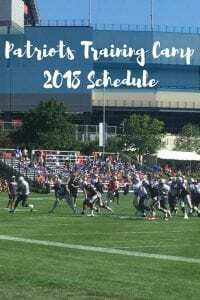 For more information about Patriots Training Camp for the 2018 season, please head here. Will you be going to Patriots Training Camp this year?